William "Doubting" Thomas, founder of the Peace Park vigil in Lafayette Park outside the White House, died on Friday morning after a long illness. He was 61; he was my friend. I mourn his loss intensely. Thomas, as he was known to all of us, began his 24/7 vigil for "Wisdom, Honesty, Truth, Justice, and Global Nuclear Disarmament" on April 13, 1981 interrupted only by numerous arrests and a "stay away" order the last year of his life. 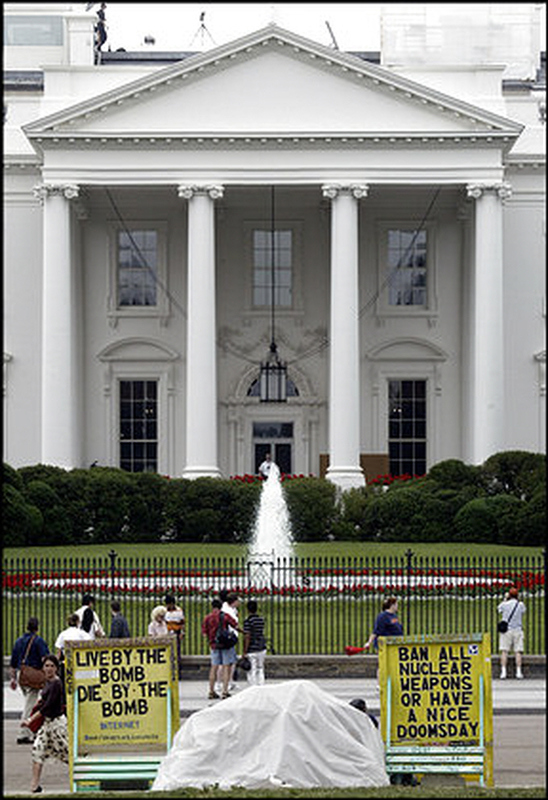 The anti-nuclear vigil became the most visible statement of an anti-nuclear organization called Proposition One. He was joined in the vigil by his more famous sidekick, Concepcion "Connie" Picciotto, who achieved a small measure of fame when she was filmed by Michael Moore at the vigil for a scene that appeared toward the end of Fahrenheit 9/11. As we mourn the loss of Thomas, we must remember that Connie struggles on and needs our support. The Peace Park vigil is certainly a tourist curiosity, situated right across the street from the White House on Pennsylvania Avenue, so close that it has been dubbed 1601 Pennsylvania Avenue. Over the years, the National Park Service has tried to remove it many times, but it remains the eyesore on the front steps of the greatest power the world has ever known, reminding us of our role as a nation in nuclear destruction and urging us to stop now and forever. Unfortunately, that message is as pertinent now as it was when Reagan was ratcheting up the Cold War in 1981. The United States still possesses the world's largest nuclear arsenal; more nations possess nuclear weapons than ever, and the world's energy crisis is increasing calls for nuclear power (or disguise it in the form of hydrogen power, a byproduct of the nuclear process). This issue is what my friend Thomas fought for, passing out information, talking with strangers, and keeping watch year after year, decade after decade. Thomas leaves behind his beloved wife Ellen, whose email message reached me this evening. When they were not at shifts at the vigil, they lived in a house not too far distant called the "Peace House," taking in and feeding homeless people, providing space for the Washington Peace Center, and providing a welcome mat to anyone who needed anything or simply wanted the company of good people. Whenever I visited Ellen and Thomas at the Peace House, I was chastised for not coming by enough - tonight, I regret that I didn't. What I want to reiterate to you all and to Ellen, if she reads this, is the role that Thomas and the Peace Park vigil had on my life. I had a transformative experience in November 2000 because of Thomas and the vigil he started. Without that experience, I really don't think I would have taken the road I went down as an anti-war activist, as a global justice activist, and now as an advocate for buffalo in and near my beloved Yellowstone National Park. It was one of those experiences I will never forget, and it made a profound difference for me and no doubt the people I have been able to touch through my own activism. If you recall, in November 2000, we had a contentious presidential election involving George W. Bush and Al Gore. I had only moved to Washington, D.C., that past spring in order to work on a Ph.D. in philosophy at Catholic University. However, as upset as I was by the politics and the process of what was happening in Florida, I did not do anything. Never had I protested; never had it really crossed my mind. That was something my parents did during Vietnam; I had thought that era of history was more or less gone, though it had never really stopped. In any event, I was temping at the Urban Institute over in the Dupont Circle area. One morning I couldn't shake the feeling that I needed to do more, but I didn't know what. The only thing that came to my mind was how much I hated the death penalty; however, I didn't really know if that was what was calling me. I got off of work early in the afternoon and wandered in the direction of the White House. There I saw the Peace Park vigil, which for some reason at that time was set up near H Street on the other end of Lafayette Park, perhaps because the city was getting ready for another inaugural, which tended to move the vigil. I don't recall whether I saw Thomas or Connie, but there was a man there. He looked defeated and sad, as though he needed something from me. All of my being wanted to go up to him and simply say, "God bless you." However, I can be painfully shy sometimes, and I couldn't work up the courage. Instead, I walked away saying nothing. There have been few times where I felt more guilty than I did at that moment; it is a hard thing to explain because there was nothing technically that I had done that was wrong. Yet, inside of me, I felt this incredible moral failing. And, there was something in that feeling that told me that I needed to be doing more, that to make up for what I had done wrong I had to become active. And, so I did. I became involved in grassroots organizing, protesting what was happening in Florida. Within weeks, I spent an entire night on the sidewalk in front of the Supreme Court. It never occurred to me that what felt like an amazing feat for me was something that Thomas probably could count years of his life doing in Lafayette Park. I worked with others to try to start a grassroots group. Though that experience burned me in many ways, it didn't ultimately stop me. The lead up to the war in Iraq led me to anti-war organizing, led me to the DC Anti-War Network, and ultimately that work led me finally to know Thomas, to know Ellen, to know about Proposition One and the Peace Park vigil. I'd spend time occasionally covering the vigil when someone had to go for a bathroom break; I joined my partner Genevieve when she and a friend named Midge held a solidarity one week vigil alongside Peace Park. I spent another night in the park honoring the work of the vigil. And, I got to know Thomas little by little. So, Peace Park and Thomas inspired me to where I am now in so many ways. So many of you getting this know my work right now on Yellowstone issues, but Thomas is an important inspiration that drives me. And, I miss him. When I knew Thomas, he had this dog named Wise Guy, who died a few years ago. Wise Guy was a pit bull, and yet Thomas kept him at the vigil without a leash. What a sweet dog, and Thomas once got arrested because of Wise Guy not being on a leash. And, yet, through millions of tourists, I never saw anyone afraid of Wise Guy. However, Thomas, when he was in a foul mood, could scare you because he was so passionate and could be so caustic toward the relentless BS from people who tried to defend American war and nuclear policy. He had certainly heard it all, and yet someone would inevitably approach him as though they were giving him an argument he had never heard before. I delighted in watching Thomas talk with people. It was clear in recent years that Thomas was ill, and I'd often feel sad knowing that. Nevertheless, I was amazed at the way he kept up his commitments despite how badly he often felt. I saw so many activists fall by the wayside over much, much less. Sometimes, I felt that a lot of people thought the Peace Park vigilers were crazy, and I can only imagine what endless days in the tourist hell outside the White House in all kinds of weather does to one's sanity. However, I have always been convinced that that vigil is the sanest expression of protest against war, that war and those who perpetrate it for any reason are absolutely nuts and that no amount of rationalization in the world can make the carnage of war any more sane. When such power is held in the hands of one man, that's insanity. I heard that a CIA drone killed 18 people in Pakistan today, and few here would blink an eye. How can anyone - are you listening Barack Obama - have that kind of power; how can anyone with that kind of power dare to use it? Thomas was just one man, and perhaps he and Connie alone have stayed sane while we all delude ourselves that the madness of the world is normal. I want to fight the madness like Thomas fought the madness. Nuclear war vigils seem distant sometimes to me in the relative paradise of Montana, surrounded by mountains, near the most beautiful and greatest wonders of the world. Here we deal with issues related to the land and those that live on it and the way we should live with land. Yet, another dear friend of mine in the Washington area, John Steinbach - and a friend to Ellen and Thomas - understands perhaps better than anyone how nuclear issues relate with indigenous issues (where on whose reservations so many nuclear tests have been conducted) and relate with land and wildlife issues. Like John, I can't see the Yellowstone I love and the buffalo I love without giving a loving glance back to Ellen and Thomas. Thomas, we are hurt in ways we scarcely understand by your loss. The best I can do now is write this ode in your memory and honor, Thomas, and hope that a few people take notice to make the commitment and the connections that your life was about. "Wisdom, Honesty, Truth, Justice, and Global Nuclear Disarmament" indeed. On January 5, 2009, I was a participant in a march on behalf of the wild buffalo population in Yellowstone National Park, animals who have been denied year round habitat in the state of Montana. The action, sponsored by Buffalo Field Campaign and Buffalo Allies of Bozeman, was in Helena and was targeted at the swearing in of the state legislature and Gov. Brian Schweitzer, under whose watch the greatest wild buffalo slaughter since the 19th century has happened. It was in support of the Montana Wild Buffalo Recovery & Conservation Act of 2009, which calls for shifting management of wild bison from the Montana Department of Livestock to Montana Fish, Wildlife & Parks so that bison are managed as wildlife instead of as animals in need of disease control. During the action, about 15 activists from West Yellowstone, Bozeman, Missoula, and Helena were able to get inside the capitol rotunda with signs that read, "Stop the Slaughter" and "Stop the B.S. = Buffalo Slaughter = Brian Schweitzer." Reporters took our pictures, filmed us, and wrote articles about it. Those are most of the basic facts about the action. I can also add that the crowd - mostly Montana policy makers and their families - received us mostly with thumbs up. One of our number reported that the governor acknowledged our sign. I can add that the march through the empty streets of Helena reached few people. Perhaps, I should also add that a native man joined our action outside of the capitol and supported us inside the rotunda. There was no trouble from Helena police; besides the signs and buffalo masks, there was no disruption inside the rotunda. After the rally, participants expressed a sense that the action had gone well, especially once we were inside the capitol, where policy makers were forced to notice and where reaction was mostly positive. However, the basic facts of an action often miss one of a million other things that can be said. What we are doing is for the buffalo, and while the rest of what I write will deal more with the people power aspect of the action, we cannot forget that the buffalo are at the center of everything that happened. Without the basic injustice being done to this animal by Montana and the federal government, none of what we had to say would have any resonance. Without the great disconnect that we who are living on this continent are continuing to have because of the way we confine buffalo inside of Yellowstone National Park, the drama of the moment would be missing. The organizing of people around a cause, the friendships and challenges, and even the resistance against us would mean nothing if not for the animals caught up in the absurd way we play god over everything under the sun. All that said, in any action I am regularly struck by the metrics we come up with for judging its success. At the most basic level, we can ask ourselves here whether this advances the cause of the buffalo. And, while helpful to have that framework, that really doesn't get us much further in answering the question. It also seems likely that the success of an action targeting any injustice likely would have similar metrics, and there's no reason not to broaden the continent of our question in just the way we would hope that the buffalo might broaden across the North American continent. So, based on what I felt about the action, I want to say that the action was a success. If it was a success, what made it successful? How successful was it? These are all incredibly difficult questions to answer because a lot depends upon what the ultimate goal posts are and how much is possible for a particular group of people acting a particular way. As I understand the question, fighting the injustice of buffalo confined to Yellowstone is only the beginning of an incredible problem facing our society. Yellowstone is that place that was set aside after everything else had been run over or was about to be run over. It was the refugee camp for centuries of pillaging a continent, a pillaging that continues. Undoing everything that was ever done is not even possible; however, undoing the ethical arrogance that continues to drive our relationship with the land must be possible if we are to be better off. Yellowstone itself suffers under the weight of the burden. We must free what is trapped within Yellowstone also to free Yellowstone; and we must also do this to free ourselves. I know that all of that sounds poetic, but this is not the place to rehash old arguments, demonstrating the logical fallacies in our prevalent world views about our relationship with the land. In any event, I think the goal posts are very far from us, and I also think that the individual should, in her or his particular actions, fervently avoid any action that would give that person power over the agency of another. What I mean is that no person should ever strive for too much power - even for an apparent good - lest you simply create one fundamental problem to replace another. I should never have any right to have power over you and your decisions; I might resist the power you wield over others, but I have no right to become lord over you as you lord over others. Thus, the challenge against injustice is of a great scale - like the one we see with the buffalo, like the one we see against indigenous people, like the one we see in warfare, like the one we see in sexism, like the one we see in racism, and on and on - and we have to realize that our particular power in exerting our influence over a situation must necessarily be small. We are only capable of small feats against great problems, and that is a terrible dilemma for anyone who wishes to fight against injustice. I believe that our action in Helena was a small feat that can help us move toward defeating a great problem. Remaining small in scale to fight what's large in scope requires incredible creativity and persistence in organizing. It requires communication, organization, and flexibility. If my action is going to ever be part of something large enough to fight the problem, it has to be part of something that encourages others to take similar actions. It has to be part of something that inspires us to reach out for others and increase our network of support. We have to at once build our own small communities - family units, if you will - while using those family units to build herd after herd so that the injustice eventually falls apart. However, that's a romantic analogy; in truth, it's very difficult for families to get along, for groups of people to get along with other groups of people, for those groups of people to stay in touch, to collaborate, and to build the movement necessary to overrun injustice. It may be hard, but it had better not be impossible. So, let's look at the action in Helena. What it was first was a collaborative effort, spearheaded by a strong small community - Buffalo Field Campaign - inspired by another small community - the legislation proposed by the Gallatin Wildlife Association - in conjunction with a budding new community - Buffalo Allies of Bozeman - built on connections that already existed with people in Missoula and Helena. However, beyond that, it drew new people in - marchers not known about in Helena, inspiring new connections in our group in Bozeman. Secondly, the action managed to reach the media so that others have the opportunity to know and take action. It provoked the power holders and those guilty of injustice to react, as Schweitzer apparently did. It inspired those who took action to want to take more action, to share their experiences as I am here, and therefore to do more. Of course, the gains of the action are tentative; their permanence depends on us continuing to chip away, to continue making connections, and to work on inspiring new people both to join our group or to perhaps form their own groups. Maybe, protest isn't your thing; maybe, you are an academic and have information to share. Maybe, you are a farmer and have food to share. Maybe, you are a poet or a musician and have beauty to share. Maybe, you are a cynic and have your honesty to share. The point is that the more we build these connections and embrace and overcome the challenges that arise, the stronger we will become, even though our own individual efforts will remain small and tied to the families and communities with which we belong. That is the core of people power. Now, if I am wrong that the individual should not aspire to overwhelming acts of heroism or wrong that the problem of the buffalo is huge, then perhaps one could argue that the action was not really a success because the acts were tiny but not large enough to handle a relatively small problem. In that case, no doubt people will keep throwing their money and their energy at that individual who promises to fix the problem. I think that's why people have such faith in electoral politics. If only this guy - for some, it was once Brian Schweitzer - gets elected, then he can fix this problem. We can argue about that, but I will contend that the problem with the buffalo is greater than the Montana Wild Buffalo Recovery & Conservation Act of 2009 and that respecting any animal as wildlife opens quite a pandora's box. And, I will continue to argue that it's beyond any one of us to fix. So, that's why small acts - like pushing for this bill, like rallying in support of it, like organizing in Bozeman, like connecting with friends in the movement - can truly be the most effective and meaningful acts that we undertake. Again, that's my assertion, but I must keep my ambitions relatively small for this essay to be a success. Thus, protesting, marching, and holding signs can be powerful when they tend to build the roaming of the movement that they are supposed to support. If we are looking for the knockout punch, we are in the wrong sport. Winning will come as we build strong families and strong herds (i.e., strong families and strong communities), but that is built on what might seem to be a lot of pointless moving about. It can be, sometimes, but if you look closely at this action in Helena, this one was far from pointless. Yes, we made our point to Gov. Schweitzer and the politicians of Montana, but more importantly, we made it with each other in a way that can only make us stronger and make our point more strongly. Somewhat related, please read about the May 2008 action in Helena that I wrote about here. A new year has begun, one of the arbitrary boundaries we set in order to measure the passage of time. It's a time where we reflect backwards and look forwards, and doing so is socially shared. We all do it, and even if we don't, we are conscious of the fact that we don't. Even the rebels among us who treat New Year's as just another day do so fully aware of what they are not doing. New Year's, arbitrary though it is, nevertheless has a stunning significance. For me, it almost marks my first year since I've moved much closer to my beloved Yellowstone. In fact, the day I moved here was December 23, 2007; however, it's close enough to the magnetic pull of New Year's that it might as well be a year today. What a neat year it has been, watching my little baby boy grow, watching the seasons change, adoring the mountains, co-founding an activist group, moving into a new house, learning to ski, and taking every opportunity I could to know Yellowstone. Who knows if next year will be as fortunate? The impermanence of our experience is in part what makes it so compelling. That it might be otherwise or might have been otherwise, whether by luck or our own control, the possibility of what might have been or what might still be certainly is part of the drama of our existence. We never know whether the moment we live might be our last or whether bad times might be better or worse yet. We'd like to think that what goes up might go down, but we wonder if it mightn't just keep rising forever. The odds that I would be here right now writing this essay in this place are almost impossible. That I am when I might not have been, that I am here and not there, there is nothing that can amaze the mind more than imagining all the possibilities. Perhaps, that's why people are so drawn to doom. In recent days, a ridiculous number of people have been drawn to reports of a large swarm of minor earthquakes in Yellowstone. There have been hundreds of small quakes within the Yellowstone caldera, one of the world's largest volcanoes (supervolcanoes). There's nothing unusual about small or even large earthquakes in Yellowstone, but what made this newsworthy was the sheer number of earthquakes all at once mostly in the same area. And, once that became a national story, it has drawn out dozens and dozens and dozens of blog posts about it, a great many of them with apocalyptic predictions of what might come, or in the words of many, what surely will come. It has been almost absurd to see that my newspaper on all things greater Yellowstone has had more unique visitors the past couple of days than any other day of the online paper's existence. That's more striking because we are not in the main tourist season, and in fact we are in the holiday season. It's been particularly hard to keep up with the sheer number of blogs posting opinions on this. Like New Year's draws us in right now, for me, the fact that so many people are obsessed with news about the very common occurrence of earthquakes in Yellowstone is something that I cannot avoid thinking about. So, impermanence is our lot. We will die. The Earth one day will surely be gone, at least when the sun finally explodes, perhaps sooner. What we work to protect, what we fear of losing, we all will lose. Just as today passes into yesterday, we will lose the possibility of what might still be into a merely what might have been. Doom, whether it comes in a spectacular ball of fire, or dying quietly surrounded by hospice caretakers like my partner Genevieve cares for, is certainly our lot, at least in terms of our lives here on Earth. Old Faithful will be gone one day. And, yes, one day, that supervolcano will indeed explode. However, the fact of doom is perfectly normal, the essence of mundane. However, no one is interested in something simply because it is perfectly normal. No one is interested about my sleeping schedule, when I choose to eat, when I choose to relieve myself. Few particularly care whether I live or whether I die. The inevitability of doom isn't what's attractive to people; what is attractive is thinking the possibilities of what might happen. People are attracted in particular to the manner of their death - or perhaps the death of others. If someone is murdered, they care more than if they happened to die a slow, agonizing death overcome by dimentia, or perhaps Parkinson's--like my grandmother. The unexpected--the death of a young child, the sudden heart attack, perhaps a suicide that was a surprise. And, the more bizarre and unusual, the more attractive. If we all go down in a fire of ash, suffocated by chlorine gas, and an ice age, caused by the most beautiful place in the world, now that's a story. That's something people can buy into; that's really an attractive way to die or to cheat death. That's drama, and that's the kind of possibility that people dream about. And, even if it's not likely, that the notion that the supervolcano is overdue is based on a very weak inductive generalization of the fewest instances, the sheer possibility, the knowledge that maybe we are the lottery winners in a game of the most sensationalized doom, is enough to keep hope alive for those who don't want their lives to be merely normal, their doom to be like all the others. That it's sadistic to the hilt is of no matter; I imagine many thousands of people were thrilled at first when Hurricane Katrina struck hard. It's disgusting and revolting but no doubt true, or else why would cable news outlet after outlet send reporters down to the eye of the storm? They don't do it because they are concerned; they do it because people have a fascination with disaster. When terrible disaster struck, the sensationalism couldn't last but a few weeks even though the problems for the people of New Orleans still remain. But, at that point, it was mundane. People were used to it; the drama of the true tediousness of life no longer concerned them. Perhaps, people felt a little guilty for wishing such doom, but then the thought creeps in, "What if it were to happen again?" In fact, disasters are happening in Yellowstone right now that are apparently not sensational enough to matter. Wolves are caught in the crosshairs of political disputes and land wars. Buffalo were slaughtered in record numbers in 2008 by the government. Unexploded ordnance, all to keep Sylvan Pass open during winter for a few snowmobilers, litter eastern Yellowstone (oh wait, you didn't know about that, isn't that a disaster waiting to happen?) No doubt that all around Yellowstone, you won't have any trouble finding hundreds of people whose obituaries are being written and thousands of animals who die in the life and death struggle of the ecosystem (oh wait, you really dig that - that's what National Geographic or an Anderson Cooper special are for or perhaps all the spotting scopes in the Lamar Valley). But, how can any of that compete with supposedly impending planetary doom? One person's year, one person's possibilities, one blade of grass's hopes and dreams cannot possibly connect us so powerfully. Just as New Year's connects us all, we are connected by really big, unique notions of doom. There might be no helping our sensationalistic tendencies; how can we tell anyone not to imagine doomsday scenarios? We are drawn magnetically to considering what might be. However, I think sometimes our imaginations aren't brilliant enough. That might seem odd considering some of the apocalyptic nonsense that you can read online right now about Yellowstone or the Mayan prophecy and 2012. It seems the imagination is doing well, but is it? Actually, it's pretty dull and predictable. People are drawn to the same kinds of disasters - volcanoes, earthquakes, meteors, plagues. It's particularly dull to see so many people running to my Web site looking for the same thing. Rather than evidence of a vivid imagination, it's evidence that people are basically trapped by the same societal paradigms. Those who are accused of having overactive imaginations in fact are just guilty of bad reasoning, and those who spend all their time debunking them - while just as lacking in imagination - at least have the good sense not to be totally trapped. What I mean by a lack of imagination is that we seem unable to understand anything close to the full range of possibility so that we might empathize with anyone or anything caught in any situation. There's absolutely no reason that we cannot wonder at the situation of a single pebble in our backyard. Now, that we don't wonder about these things isn't always surprising, but it would be far more interesting to live in a world where we at least are making the effort. Every time the wind blows over the surface of our lands, an entire universe is displaced. One breath of air is doom for an infinity of molecules. Just the wonder of such a reality where disaster lurks around every keystroke can compel us, can help us reach new levels of empathy for our world and for our own situation. The what might be and what might have been is infinite; there's no reason to fall back to the same scenarios of doom. Right now, we are stuck in a New Year's state of mind, not that there's anything wrong with that. What's wrong is that it's so dull. It's all very much the same, lacking in the critical variety of experience that our five senses demand. So, this New Year's, I don't resolve to be rid of it. How can I? But, I do resolve to wonder just that much more at what's not being wondered about, to care just that much more, and if in the process, I'm forced to consider a lot of doomsday scenarios about things all too familiar - like the Yellowstone supervolcano - so be it. At least, I'm not going to confine myself to just the same kind of essay. Hopefully ... hopefully ... there is something new under our weary sun.